Experience Kenya’s breathtaking scenery and wildlife at Hemingways Ol Seki Mara, a luxury tented camp located in the Naboisho Conservancy and adjacent to the stunning setting of the world-famous Masai Mara Game Reserve. This beautiful camp is named after the Ol Seki tree, the sandpaper tree, which. in the local Maasai language, means “blessed”. It is a peace tree whose branches are used to settle disputes. 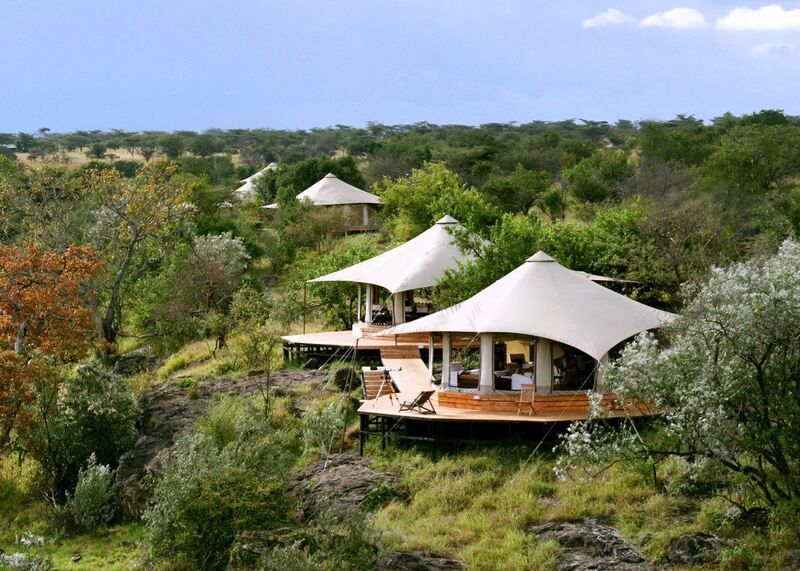 Ol Seki Hemingways Mara is a small personal tented camp is set on a wonderful rocky promontory offering spectacular panoramic views over pristine landscape. Located in the Mara Naboisho Conservancy of 200 square kilometers, 50 000 acres, of vast wilderness, where only the vehicles belonging to the seven properties in the conservancy are allowed to drive. Ol Seki Hemingways Mara is open year round. Ol Seki, named after the sandpaper tree – symbolising peace and harmony in Maasai culture – offers mind-cleansing views and spectacular sunrises and sunsets. Ol Seki Hemingways Mara boasts 10 superbly appointed safari tents, each with a spectacular 270-degree view of the Mara plains below, offering comfort and luxury in the African bush. You will have the chance to witness some of the rare wonders of the natural world, including the annual wildebeest migration and the Big Five. Head chef Evans prepares absolutely, delicious, fresh food to be served in the dining tent with panoramic view, or a private al fresco meal on the deck of your tent. The kitchen is mobile, so on occasion you may find the restaurant floor to be the grassy plains of the conservancy and the ceiling the stars of Kenya, while the fire roars and the crickets chirp – an unforgettable dining experience. Naboisho, meaning “coming together” in the Maasai language, explains how this conservation area was created. It’s a community-driven alliance that protects the flora and fauna of this precious region and supports the landowners and farmers through tourism. The Naboisho Conservancy is home to large numbers of resident wildlife. Elephants gently wander through the acacia scrub, hippos submerge in the small pools, elusive leopards can be spotted in the high branches – the determined guides of Ol Seki Hemingways Mara will train your eyes and awaken your slumbering senses in order to pick up signs of nature. You have a good chance of seeing, in addition to elephants and hippos, jackals, baboons, honey badgers, hyena, zebra, giraffe, buffalo, wildebeest, impala, eland, topi, lions, leopards and cheetah as well. The endangered black rhino can be found in the dense bush, and, on occasion, the rare African wild dog can also be seen. The Naboisho Conservancy enjoys a pristine and stunningly beautiful landscape. The photographic opportunities are exceptional, with rolling hills and open plains, the iconic sparse Acacia trees among which animals graze in the shades. Beyond the immediate vista, the Ngama hills hem the horizon to the east and beyond lie the plains of the Maasai Mara. Naboisho is a healthy region of biodiversity – shining grasses which nourish the migrating herds between the rains; forested banks of seasonal rivers; rocky outcrops among which the hyraxes hide. Not to mention, the sunrises and sunsets that the Greater Mara is famous for – providing exceptional opportunities for silhouette photography. Being in a private concession will allow the photographer to be alone at sightings, providing photographic opportunities in privacy. It also means no gate times to adhere to and the possibility of going off-road if the photo opportunity requires it. This issomething that cannot be done in the public areas of Maasai Mara. Ol Seki ensures photographers a truly exclusive and private safari offering a plethora of photographic opportunities.